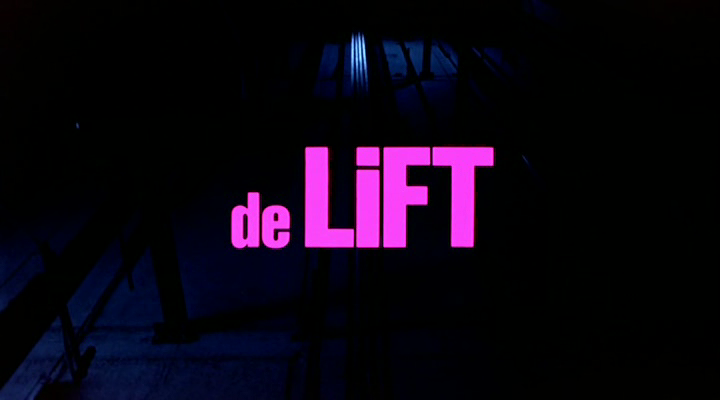 Due to the fact that it is half decent and received reasonable distribution on the continent The Lift has assumed a position of some importance in discussions of Dutch horror. The premise of course is utterly ridiculous, but is a homicidal lift any sillier than a killer car (The Car , Christine ), killer bulldozer (Killdozer ), killer laundry device (The Mangler ) or in the case of Stephen King’s cocaine fuelled disaster Maximum Overdrive (1986) killer anything as long as it’s a machine. That Stephen King’s name should be attached to so many of the sillier ‘Revolt of Technology’ pictures speaks volumes for the man. The feasible and disturbing flip side to these daft examples is those that deal with artificial intelligence and computers, and such films as 2001: A Space Odyssey (1968), Colossus: the Forbin Project (1970) and Demon Seed (1977) still retain a certain chilling frisson. 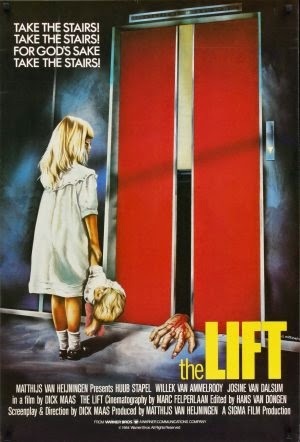 The Lift almost exonerates its absurd premise to take its place in the respectable AI camp of technological terror with an explanation that is fairly intriguing. In this case that the lift’s circuit board is made up of molecule sized, protein based, microchips that have an ability to reproduce themselves and in some basic way think for themselves. 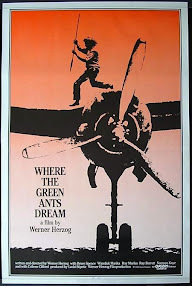 However in keeping with the general absurdist tone of the film this theory is delivered in a facetious manner, and plays second fiddle to the films primary concern which is an attack on corporate research programmes. Nevertheless it adds an interesting science-fictional element to proceedings, even if it ultimately does little to elucidate the audience as to why the lift has murder on its mind. Naturally the premise affords a number of inventive set pieces, but aside from the decapitation of a security guard (replete with very unconvincing false head) this area of the film is somewhat underplayed. A group of grotesque partygoers, having pissed everyone off at the restaurant on the top floor of the complex, are almost suffocated to death, but ultimately survive their ordeal in the lift. Nevertheless this is the first incident to suggest something is amiss and before long lift repairman Felix Adelaar (Huub Stapel) begins an investigation. Adelaar is a bit too laid back for his own good, but even he doesn’t suspect that his cursory examination of the lift will lead to accusations of adultery, the discovery of a corporate conspiracy involving his place of employ ‘Deta Liften’ and Rising Sun Electronics who provide the circuit boards for the lifts, and an attempt on his life by the psychotic elevator. Of these three unexpected eventualities the least interesting is the rather bland adultery sub-plot, and throughout the film has an interest in the Adelaar’s domestic life which translates to thumb twiddling for the audience. This is a major weakness of Maas’ screenplay, which is only slightly enlivened by Felix hooking up with journalist Mieke de Beer (Wileke van Ammelrooy). – And yes I’m not enjoying writing out these ridiculous Dutch names! She is the most clichéd character in the film, personifying as she does the dogged undercover reporter who will stop at nothing for the scoop. For example she seems singularly uncaring that she is keeping Felix out at all hours, even though he has told her he is married with children. To add some spice Maas populates his slight screenplay with a gallery of amusing and interesting characters. The Icarus complex affords him an opportunity to populate scenes with characters who serve no purpose other than to add colour, humour, or weirdness. This gives the film a certain life and vitality which is most welcome. His attempts to develop a sense of paranoia and conspiracy however are found wanting, and when the film shifts into serious mode (such as when Felix and his wife have a domestic dispute, or Felix and Mieke visit Rising Sun Electronics and speak to the disturbing and taciturn scientist behind the chaos) it is often undermined with comedy. To his credit Mass clearly decided that nobody would take the film seriously, so he doesn’t either. 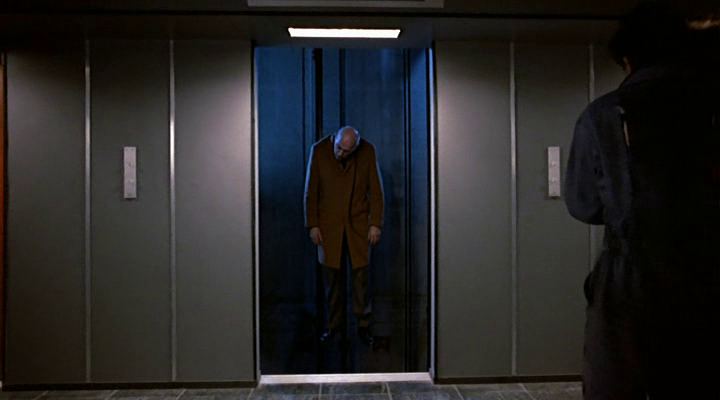 The main set piece of the movie sees Felix descend into the lift shaft, which represents the only occasion in the film that the filmmakers make any attempt to create a sense of claustrophobia. One would have imagined this might have been an obvious strategy in a film involving a killer lift! If directing and writing isn’t enough Maas also wrote the music, a shockingly poor sub-Carpenter synth soundscape. It sounds like something Tangerine Dream might have come up with when they were in primary school. 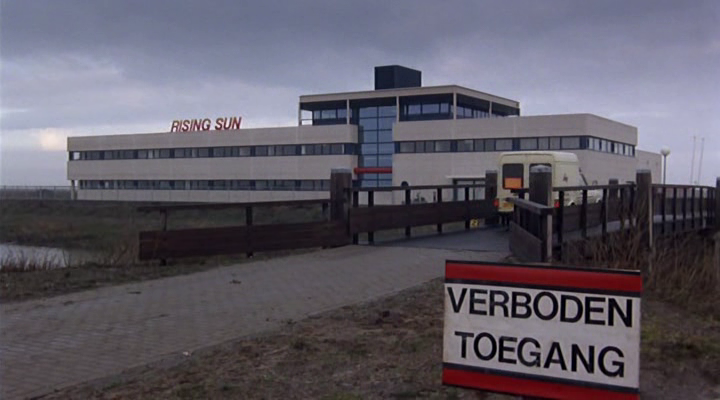 My favourite part of the film was the location shooting throughout Holland, and here Maas excels in creating a sense of bleak urban modernity, a lifeless space in which companies like Rising Sun Electronics can blend seamlessly into the blandness of the architecture. 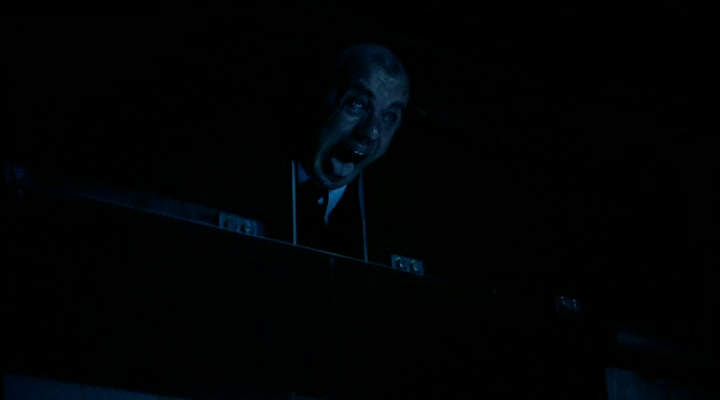 The Lift is a passable entertainment, but on this evidence you can see why there have been so few Dutch horror films.